The Mackie DLM12 is a fantastic choice for a wide range of live sound applications and users. 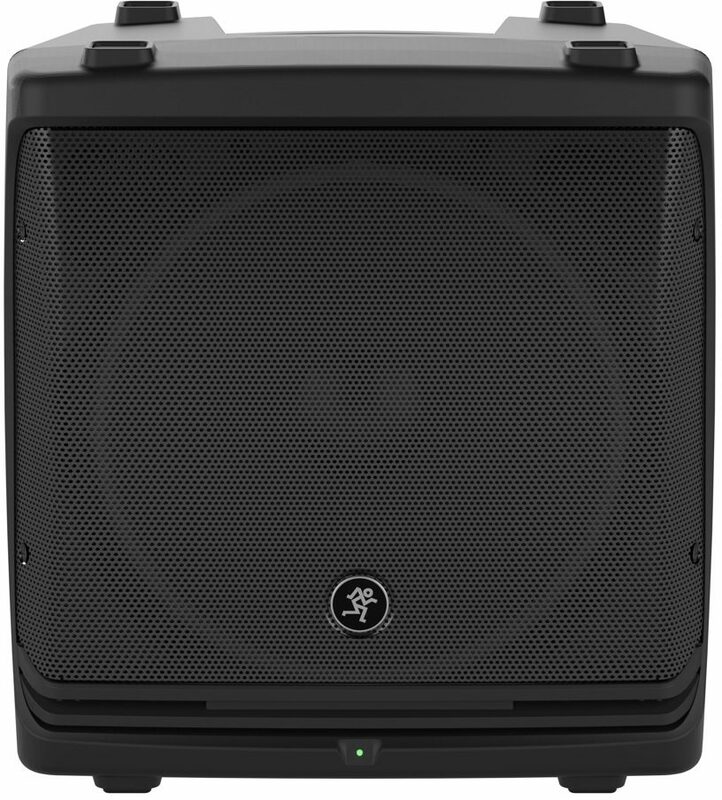 With 2000 watts of efficient class D power running through Mackie's innovative TruSource driver alignment technology, this compact speaker produces clear and powerful sound with an array of mixing tools to put it to work. As part of the innovative DLM series of powered speakers, the DLM12 includes effects, presets, and other tools to bring out the best expression of your sound in any environment. From solo singer-songwriters and DJs to full bands, business presentations, and houses of worship, there's a Mackie DLM configuration to suit any live sound situation. 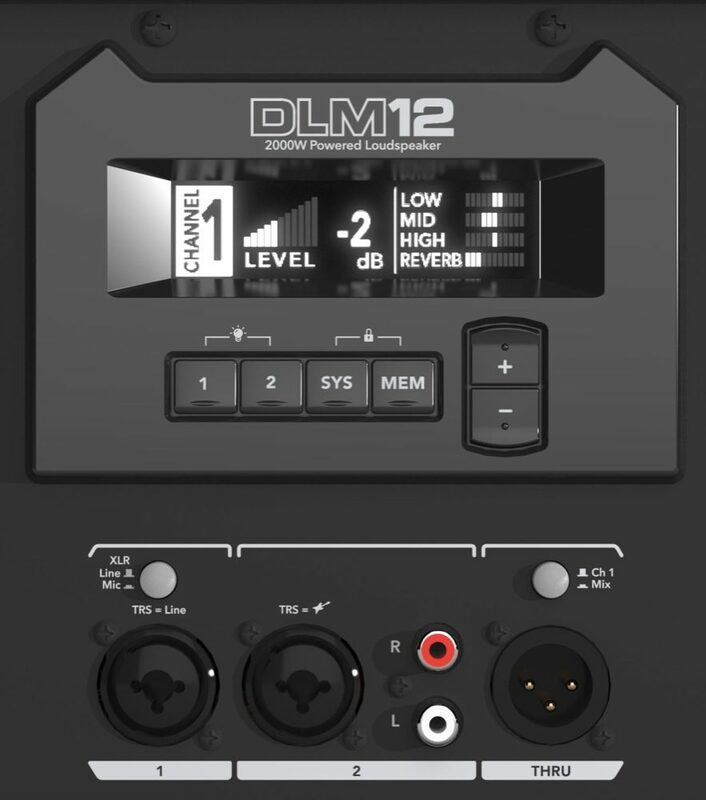 The DLM12 features an huge array of presets and mixing options, which are easily accessible through the onboard DL2 digital mixer. For starters, you get two channels with combo TRS/XLR jacks to accommodate virtually any input source. Channel two includes stereo RCA inputs to connect MP3 players and other media sources, while a thru output jack enables easy connection to additional speakers. Once you've got your inputs set, the DL2 digital mixer allows intuitive control of your sound with individual three-band EQ on each input, multi-band feedback suppression, and 16 gig-ready effects. Also included are six different speaker modes specifically voiced to cater to various performance scenarios. The 'soloist' mode, for example, brings out the best of a guitar and vocal input, while the 'DJ' mode accentuates those frequencies need to really shake the dancefloor. Once you've selected the effects and modes you want to use and crafted the best setup for a gig, you can save all settings in one of three user presets locations. One of the many innovative features of the DLM series is the introduction of Mackie's TrueSource driver alignment technology. 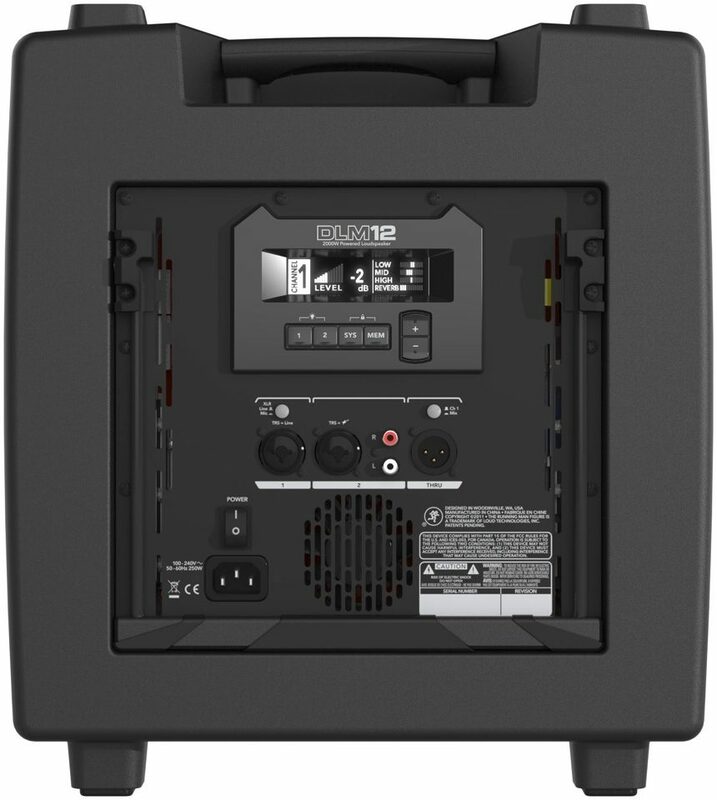 By aligning a 1.75-inch compression driver and 12-inch woofer into a single vertical column, the DLM12 increases efficiency while reducing the overall weight and size of the entire speaker. TruSource technology effectively centers the entire frequency range (an impressive 38Hz - 20kHz) to one point which reduces overlap and fidelity loss that sometimes comes with traditional 2-way systems. For all its many features and uses, the DLM12 remains a remarkably small unit, coming in at a full third smaller than comparable powered speakers. As any mobile DJ will appreciate, a pair of DLM12s can easily fit in the trunk of your car and make it to the stage in one trip. A set of M10 rigging hardware makes installation a breeze, while a standard speaker-stand socket allows mounting on stands or in a satellite setup with a subwoofer. The DLM12 also makes a fine stage monitor, with a built-in kickstand along with a monitor preset mode. If you have multiple DLM speakers set up at a distance, the DLM12 is equipped to compensate for the difference with up to 300 milliseconds of alignment delay. 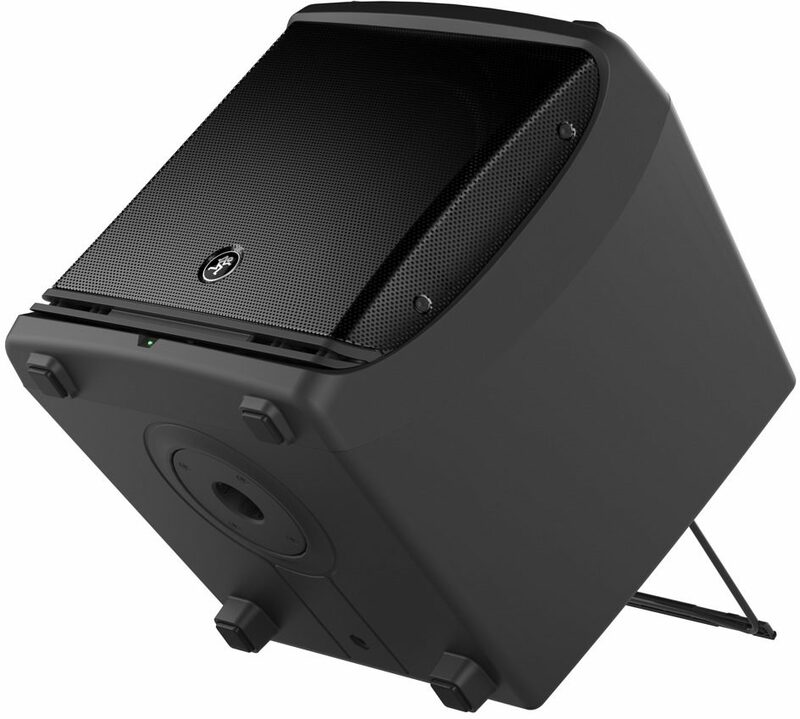 With the introduction of the DLM series, Mackie has made a major step forward in the world of portable powered speakers. 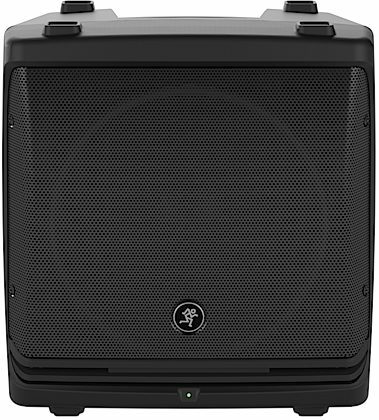 The wealth of onboard mixing options, effects, and presets primes these speakers for use in just about any live sound scenario with plenty of power to get the job done. Easily portable and refreshingly affordable, the DLM series might just be -- as Mackie puts it -- "the new shape of sound." 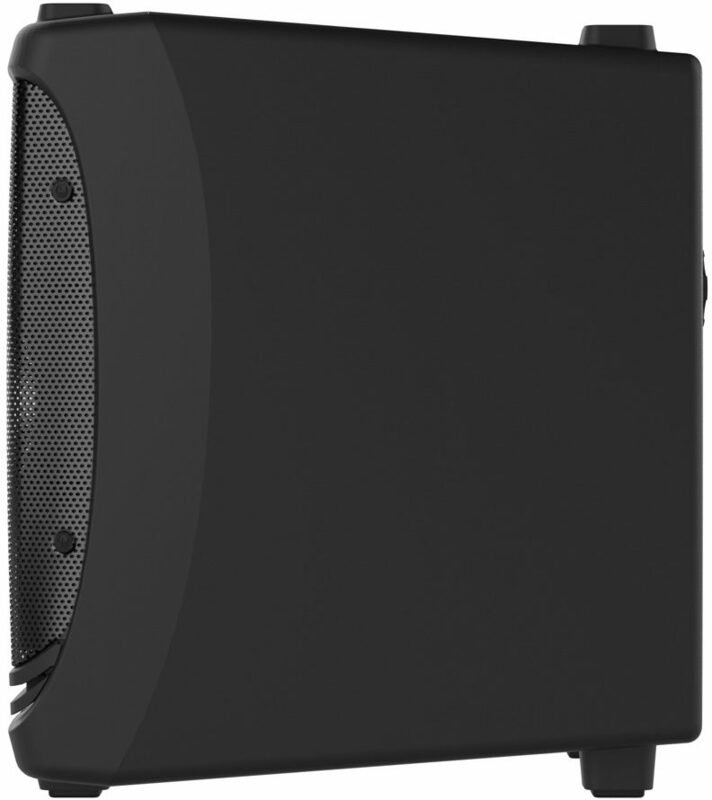 - Physical Dimensions: 15.9" x 15.3" x 14.3"
The Mackie DLM12 delivers 2000 watts into the most compact, professional portable loudspeaker design ever. Featuring TruSource(TM) technology, the DLM12 is equipped with Mackie's TruSource driver that incorporates the high-output 12" woofer and 1.75" compression driver into an incredibly compact common-magnet design. Powerful TruSource DSP delivers seamless clarity, consistent dispersion and unmatched fidelity. The versatile DLM12 features the Mackie DL2 integrated digital mixer, providing a dual-channel mixing solution for a wide array of possible connections with incredible channel features like 3-band EQ and 16 great-sounding effects. Plus, system processing like a multi-band feedback destroyer, six speaker modes and Smart Protect technology provide the tools needed for truly professional applications. 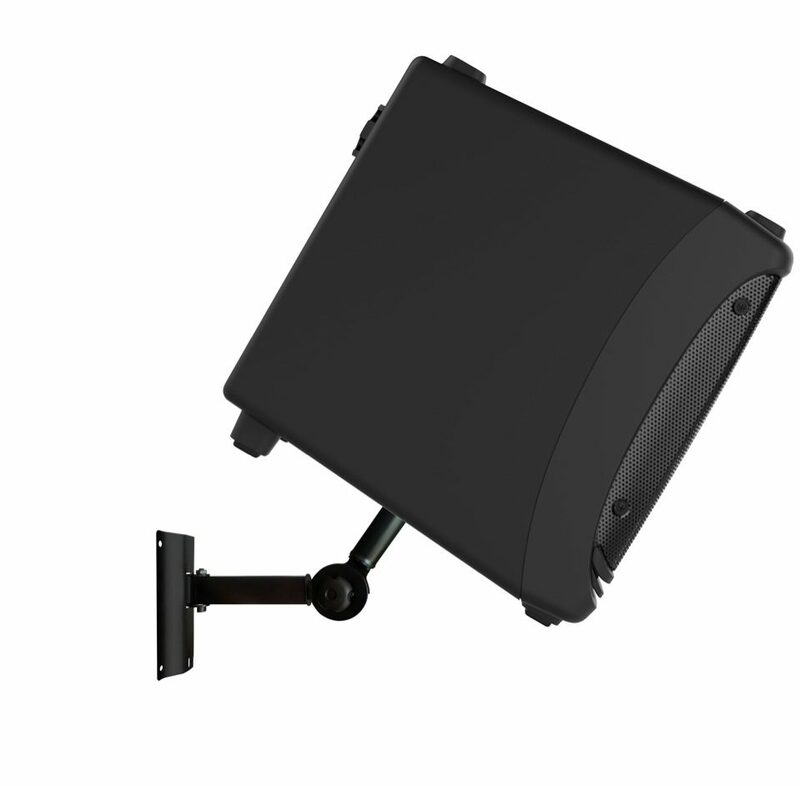 With configuration options that include pole/wall mounting and flying, the sleek DLM12 is a powerful solution for high-end installs. The ultra-compact form factor includes a rugged PC-ABS cabinet, powder-coated grille and integrated kickstand for personal monitor use. Overall: Very impressive little speaker. it has a lot of punch to it. It works amazing as a stage monitor. I also used it to DJ a wedding of 150 people. I paired it with a DLM12s subwoofer, and it worked great in a medium sized reception room. Mackie customer service in my experience is second to none. That being said, i've only had to call them for one issue, because of the quality they put into their products in the first place. the issue was resolved with no hassel immediately. Overall: I play singer song writer/folk music in some resturants where performance space is really small. Although I use a Vocalest live to power my 48V fanom power mike, and add harmony now and then, you could just plug a good mike into the speaker direct and sound just fine. I have a flute player with me and we plug her mike directly into the DLM,add a little reverb and it sounds great. People frequently comment on how great we sound. Including the owner. The sound is HD. Awsome. I also needed something lighter than my old SM450s. This speaker fits the bill perfectly. When I bought my DLM 12 I was looking for the DLM 8,but I couldn't find one at the time. I plan on getting the DLM 8 also and will use it in really tight spaces. The efects on these units are really nice. My only concern is the Mike switch on channel 1. Turn the level all the way down before hitting the switch because the gain is enormous and you will have instant feed back in some casses. I put a cover over the switch so it can't be pushed by some one that isn't familiar with the unit. It would be great if Mackie put a 48 volt mike switch on the DLMs to power the really nice vocal mikes I use. I look for easy,simple,light weight, equipment set up. This is it. I am also a fiddle player and I plug directly into the back of the unit and sit in with bands. I can be heard with out pluging into the bands PA.
close [x]Warehouse ResealedThis is typically a customer return. This inventory includes all parts, components, manuals (hard copy or downloadable) and a 90-day warranty. However, the packaging may be slightly compromised and thus it is not in absolutely perfect, unused condition like our new inventory. This inventory is a great value.